As another year draws to a close, we wanted to do something fun and lighthearted with our communities, as a way of celebrating the many amazing people who make the sites awesome. So, we’re announcing Winter Bash 2014! Winter Bash 2014 will again be available to all sites that choose to participate. We’re redesigning all the hats and adding some extra features to keep things fresh and exciting. This event will run from 15 December 2014 to 4 January 2015. 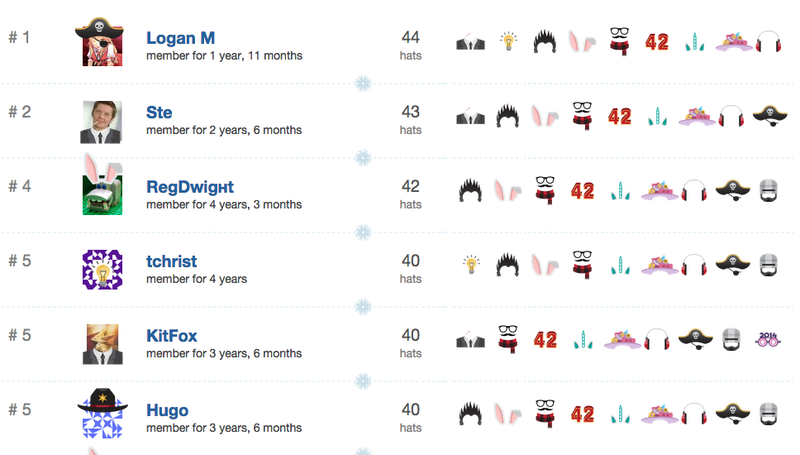 Users will be able to see their entire hat collection on winterbash2014.stackexchange.com. That site will also have a landing page, explaining the rules and other details of the event. The community of every site on the Stack Exchange gets to choose if they would like to take part in this event. Based on the very positive feedback from the last two years (2013, 2012), in which nobody has made any objections to taking part, I would like LEGO Stack Exchange to be involved in this years Winter Bash. However, if any one has any objections to taking part, please explain why in response to this question. Whilst last year the default options was to opt-out of the event, this year we must contact Stack Exchange if we do not wish to be involved. All responses must be in by 1st December 2014.